During the Victorian period it became very fashionable to go on day trips to the countryside or to seaside resorts. Picnics were often taken so that food could be enjoyed in the open air, for the working classes this meant a pasties or a pie. For the middle and upper classes picnics were not necessarily simple meals, there was often a considerable amount of food. 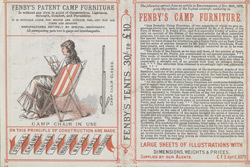 Participants would not have dreamt of sitting on the ground and so camp furniture like that featured on this leaflet was taken. Numerous servants would have been needed to carry all the food and furniture so 19th century picnics were not a simple affair.